My weekend spent at Cameron Highlands Resort in conjunction with their beautiful Christmas Lighting Ceremony was just as amazing as I expected it to be. A beautiful colonial resort surrounded by nature and great weather. Cameron Highlands Resort remains to be one of my favourite place to unwind and relax in. We were picked up at Majestic Hotel KL by SUVs and from there, we made our merry way up the highlands. This wasn't my first time here but it was my first time celebrating an early Christmas in such a scenic town that screams festive just with its' chilly weather. We were welcomed with Strawberry juice and complimentary lunch. It was absolutely just what we needed after that long ride. A cosy room that made me feel right at home. I even had the pleasure of reading up on the history of this beautiful highlands thanks to the complimentary books in my room. That night, we were treated to every Malaysian's favourite hotpot! Cameron Highlands had the perfect weather to have this in. Hot soup and a variety of everyone's favourites all in one big pot. Cameron Highlands Resort is where relaxation takes place. The beautiful spa located in the resort was everything I needed and more after the hectic weekend I had on It's The Ship. A variety of different tea spas were offered at the spa in the resort. Rose has always been one of my favourite scents, hence, I went with that. They started off with an aromatic rose oil massage followed by a rose tea bath. The rose tea bath was my absolute favourite. Immersing myself in flowers made me feel like a princess and the staff were all too sweet when it came to pampering me. After my relaxing spa time alone, it was time for high tea at the tea lounge. A variety of scones, sandwiches, cakes and strawberries were served on a 3-story platter for our indulgence. Cameron Highlands Resort fed me too well that weekend, I felt absolutely loved! 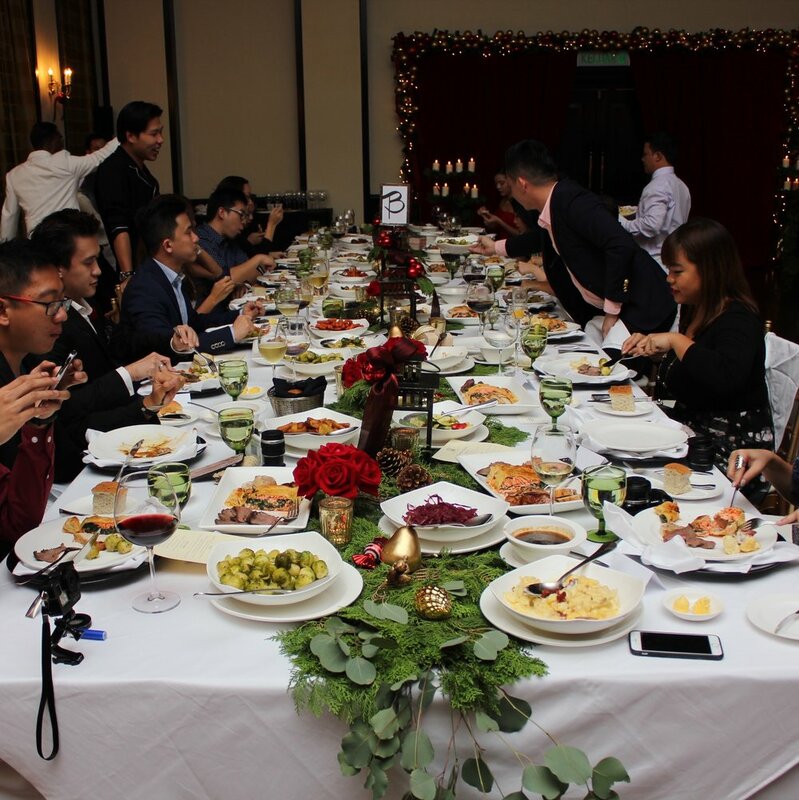 That night we had a beautiful and grand Christmas feast with all the media personnels. It was definitely a feast to remember! The food served was absolutely delicious! To be frank, I've never had an authentic Christmas feast with turkey and pastry all together at once. I was so happy to have been able to experience such a grand feast all right here in the resort. Right after the Christmas feast we headed out to the main entrance to prepare for the Christmas lighting ceremony. There were Christmas carols and a market filled with food & drinks. By the time the lights were on, Christmas felt like it was right then and there. One of the very few special moments I've had feeling so festive for Christmas. I had such an amazing time at Cameron Highlands Resort. It was such a spectacular event I got to witness and I most thankful to YTL Hotels for having me. Till next time! Watch my vlog for more!